This quickstart describes how to use .NET SDK to create an Azure data factory. The pipeline you create in this data factory copies data from one folder to another folder in an Azure blob storage. For a tutorial on how to transform data using Azure Data Factory, see Tutorial: Transform data using Spark. This article does not provide a detailed introduction of the Data Factory service. For an introduction to the Azure Data Factory service, see Introduction to Azure Data Factory. 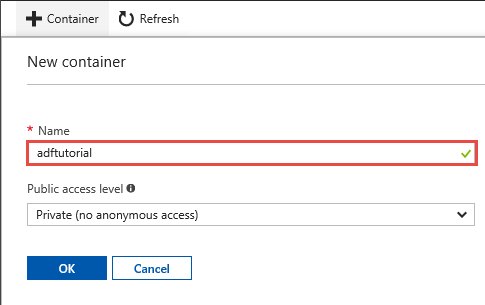 To create Data Factory instances, the user account that you use to sign in to Azure must be a member of the contributor or owner role, or an administrator of the Azure subscription. To view the permissions that you have in the subscription, in the Azure portal, select your username in the upper-right corner, and then select Permissions. If you have access to multiple subscriptions, select the appropriate subscription. To create and manage child resources in the Azure portal, you must belong to the Data Factory Contributor role at the resource group level or above. To create and manage child resources with PowerShell or the SDK, the contributor role at the resource level or above is sufficient. For sample instructions about how to add a user to a role, see the Add roles article. 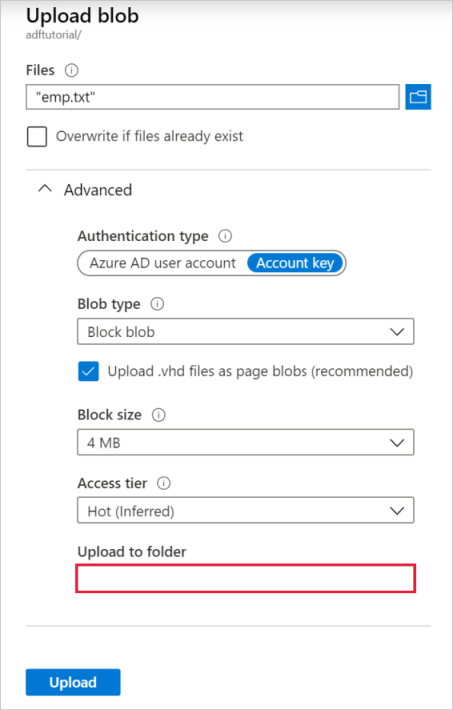 You use a general-purpose Azure storage account (specifically Blob storage) as both source and destination data stores in this quickstart. If you don't have a general-purpose Azure storage account, see Create a storage account to create one. In a web browser, go to the Azure portal. 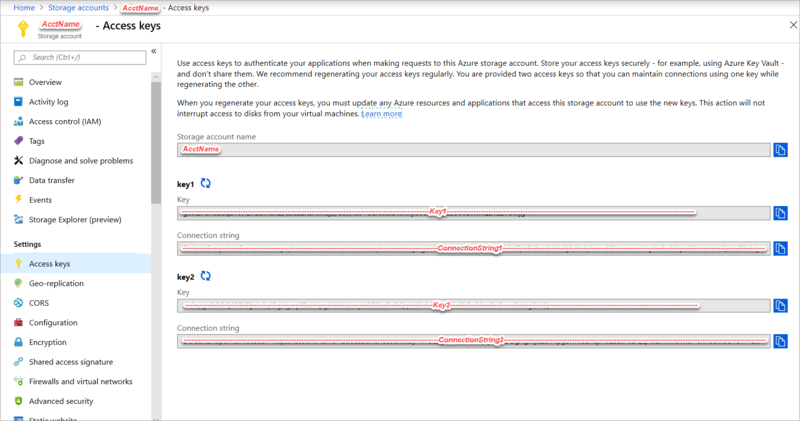 Sign in by using your Azure username and password. Select All services on the left menu, filter with the Storage keyword, and select Storage accounts. In the list of storage accounts, filter for your storage account (if needed), and then select your storage account. On the Storage account page, select Access keys on the menu. Copy the values for the Storage account name and key1 boxes to the clipboard. Paste them into Notepad or any other editor and save it. You use them later in this quickstart. 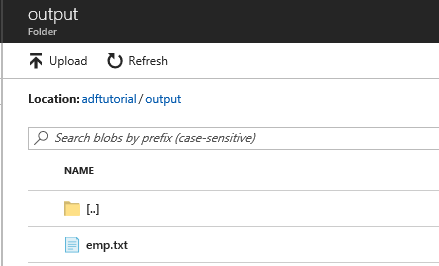 In this section, you create a blob container named adftutorial in Azure Blob storage. You create a folder named input in the container, and then upload a sample file to the input folder. On the Storage account page, switch to Overview, and then select Blobs. On the Blob service page, select + Container on the toolbar. In the New container dialog box, enter adftutorial for the name, and then select OK. Select adftutorial in the list of containers. On the Container page, select Upload on the toolbar. On the Upload blob page, select Advanced. Start Notepad and create a file named emp.txt with the following content. Save it in the c:\ADFv2QuickStartPSH folder. Create the ADFv2QuickStartPSH folder if it does not already exist. 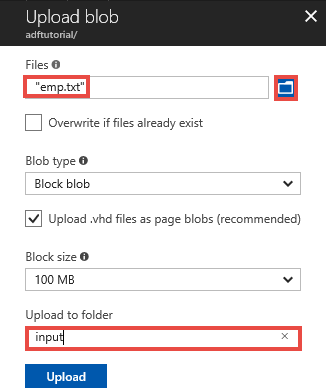 In the Azure portal, on the Upload blob page, browse to and select the emp.txt file for the Files box. Enter input as a value for the Upload to folder box. Confirm that the folder is input and the file is emp.txt, and select Upload. You should see the emp.txt file and the status of the upload in the list. Close the Upload blob page by clicking X in the corner. Keep the Container page open. You use it to verify the output at the end of this quickstart. The walkthrough in this article uses Visual Studio 2017. You can also use Visual Studio 2013 or 2015. Download and install Azure .NET SDK on your machine. Create an Azure Active Directory application. Create an application in Azure Active Directory that represents the .NET application you are creating in this tutorial. For the sign-on URL, you can provide a dummy URL as shown in the article (https://contoso.org/exampleapp). Get the application ID and authentication key, and note down these values that you use later in this tutorial. Get the tenant ID and note down this value that you use later in this tutorial. Assign the application to the Contributor role at the subscription level so that the application can create data factories in the subscription. Using Visual Studio 2013/2015/2017, create a C# .NET console application. Click File, point to New, and click Project. Select Visual C# -> Console App (.NET Framework) from the list of project types on the right. .NET version 4.5.2 or above is required. Enter ADFv2QuickStart for the Name. In the Package Manager Console, run the following commands to install packages. Refer to Microsoft.Azure.Management.DataFactory nuget package with details. Open Program.cs, include the following statements to add references to namespaces. Add the following code to the Main method that sets the variables. Replace the place-holders with your own values. For a list of Azure regions in which Data Factory is currently available, select the regions that interest you on the following page, and then expand Analytics to locate Data Factory: Products available by region. The data stores (Azure Storage, Azure SQL Database, etc.) and computes (HDInsight, etc.) used by data factory can be in other regions. // specify the container and input folder from which all files need to be copied to the output folder. Add the following code to the Main method that creates an instance of DataFactoryManagementClient class. You use this object to create a data factory, a linked service, datasets, and a pipeline. You also use this object to monitor the pipeline run details. Add the following code to the Main method that creates a data factory. Add the following code to the Main method that creates an Azure Storage linked service. You create linked services in a data factory to link your data stores and compute services to the data factory. In this Quickstart, you only need to create one Azure Storage linked service for both the copy source and sink store, named "AzureStorageLinkedService" in the sample. Add the following code to the Main method that creates an Azure blob dataset. You define a dataset that represents the data to copy from a source to a sink. 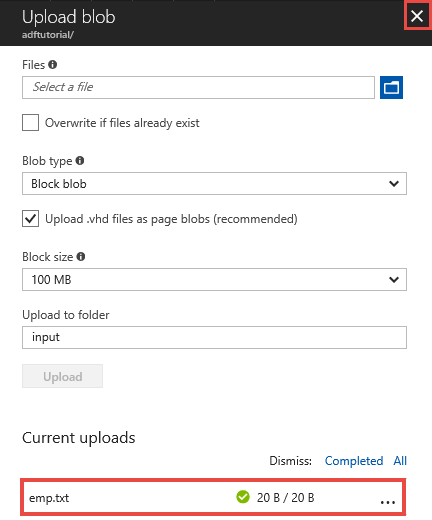 In this example, this Blob dataset references to the Azure Storage linked service you created in the previous step. The dataset takes a parameter whose value is set in an activity that consumes the dataset. The parameter is used to construct the "folderPath" pointing to where the data resides/stored. Add the following code to the Main method that creates a pipeline with a copy activity. In this example, this pipeline contains one activity and takes two parameters - input blob path and output blob path. The values for these parameters are set when the pipeline is triggered/run. The copy activity refers to the same blob dataset created in the previous step as input and output. When the dataset is used as an input dataset, input path is specified. And, when the dataset is used as an output dataset, the output path is specified. Add the following code to the Main method that triggers a pipeline run. This code also sets values of inputPath and outputPath parameters specified in pipeline with the actual values of source and sink blob paths. Add the following code to the Main method to continuously check the status until it finishes copying the data. Add the following code to the Main method that retrieves copy activity run details, for example, size of the data read/written. Build and start the application, then verify the pipeline execution. The console prints the progress of creating data factory, linked service, datasets, pipeline, and pipeline run. It then checks the pipeline run status. Wait until you see the copy activity run details with data read/written size. Then, use tools such as Azure Storage explorer to check the blob(s) is copied to "outputBlobPath" from "inputBlobPath" as you specified in variables. The pipeline automatically creates the output folder in the adftutorial blob container. Then, it copies the emp.txt file from the input folder to the output folder. 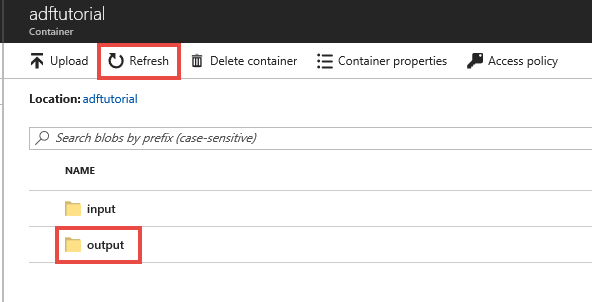 In the Azure portal, on the adftutorial container page, click Refresh to see the output folder. Click output in the folder list. Confirm that the emp.txt is copied to the output folder. The pipeline in this sample copies data from one location to another location in an Azure blob storage. Go through the tutorials to learn about using Data Factory in more scenarios.